First Line: A high-pitched scream pierced the air. Eliza Doolittle's father is the co-owner of Donegal Dancer, a champion colt racing at Royal Ascot. Eliza-- always happy to dress in her newest clothes-- is there to cheer on her father's horse. Professor Henry Higgins accompanies her to fulfill an obligation and also in the hope that he will stumble across some linguistic gems amongst the throngs of racegoers. 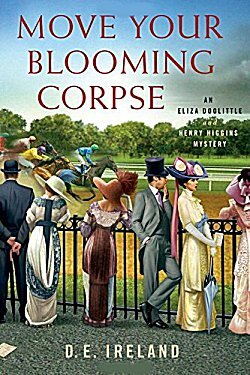 It's not a good introduction to racing for Eliza: someone is trampled during the Gold Cup race and another body is discovered in the stable area. Eliza and Henry suddenly find themselves up to their eyebrows in suspects. Adulterous spouses. Angry spouses. Suffragettes. Anti-suffragettes. Everyone in the syndicate who owns Donegal Dancer. Are these two going to be able to teach all their elocution lessons and find a killer before the next championship race? With a dedication that simply states "To Rex, Julie, and Audrey" it's easy to see that I'm not the only one who thinks of these actors when coming in contact with George Bernard Shaw's immortal characters. As a newcomer to this series, I didn't know what to expect. What I found was a wonderful blend of the Edwardian world and "My Fair Lady." The authors spoonfed just enough of the plot of the first book (Wouldn't It Be Deadly) to whet my appetite for it and to keep me from being confused. The writing team known as D.E. Ireland have created a lovely evocation of time and place. In Move Your Blooming Corpse, it's June 1913-- those last halcyon days before Europe shatters into World War I. The authors treat us not only to Royal Ascot Week, we also are able to attend the Henley Regatta. We move among the wealthy, the titled, the privileged-- and some of those wanting a few more privileges. With Eliza as an enthusiastic partner, we are treated to all the marvelous fashions, and we go deep into the heart of the organizations of women who are fighting for the right to vote. We also attend the races, walk the paddock area, take a look back at the stables, and learn about racing syndicates, bloodlines, and kidnapping. If that last part bothers you, don't worry. Although horse racing does play an important role in the book, it doesn't overwhelm the story. No need to bring out the feedbag or curry comb! Once all the characters were properly introduced, I didn't have a difficult time in identifying the killer, but as in all good examples of the art, whodunnit isn't the sole aim of crime fiction. I luxuriated in the setting and was delighted by the interplay between the characters-- especially Eliza and Henry, and Eliza and her father. I can't say that I was much enamored of Madame Lafarge, but she certainly did add to the wit and humor in the book. What an interesting idea for a mystery series, Cathy! I would never have thought of that! And it is in a great time/place setting. Glad you enjoyed this. I have to admit that I was pleasantly surprised by how much I enjoyed it, Margot! I'd read the first one, didn't know until I saw it in the sidebar that the second was out. I'll have to look for this. I'm glad that the publisher got in contact with me about this one. I'd made note of the release of the first book, but-- too many books, too little time-- didn't read it. I'm certainly glad I read this one.